SOLE AGENT! Unique fisherman house located at the end of a quiet street close to the center. Open the gate to discover a terrace hidden from outside, wel-oriented to enjoy sunrise. Walk into the house to appreciate the great volumes of the living-room extended by a loggia and its skylight. 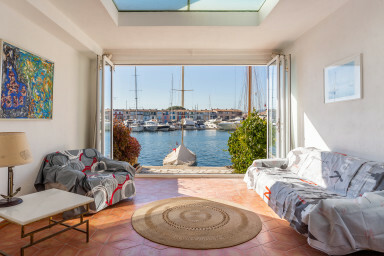 The loggia can be fully opened to show a wonderful view on the Marina and the Church of Port Grimaud. So the ground floor is very spacious for such a house. On the 1st floor, a bedroom with a large terrace on the canal side, a bedroom with a balcony on the street side, a bathroom and separate toilets. On the 2nd floor, a bedroom with a balcony and a lovely view on the boats, a bedroom on the street side and a shower-room. On the canal side, a West-oriented terrace with no vis-a-vis. This house has got 2 terraces on the ground floor to enjoy the sun all day long, a large terrace and 2 balconies on the upper floors. In front of the house, a 14m x 4,20m mooring. A unique and spacious house!